And life is going on in Venezuela. Across the country the orchestras still rehearse, schools and universities remain in session, and even in Caracas, there’s a sense of “business as usual.” On June 10th I visited Altamira, the wealthy district that was the epicenter of the violence earlier in the year. There were literal and figurative signs of the past unrest: political graffiti adorned large metal barricades recently erected around open construction sites, but the sidewalks were thronged with Caraqueños calmly going about their lives. None of the tension of the tinderbox awaiting the incipient spark. If anger remains, it has retreated to regroup, or is seeking new outlets. Life goes on in Acarigua too. The Thursday of the start of the seminario would mark the first day of a wearisome, 10-day long shuffle for the orchestra between the spacious but noisy atrium of the main club building and the cramped, unduly exposed quarters of the gazebo in the surrounding grounds. Both spaces were open to nature to different degrees, with nature alternately manifesting as intense heat, tropical downpours, oppressive humidity and pervasive insect life, the last most disturbingly in the form of invisible mosquitoes whose passage was marked only by the extraordinarily large turgescences on any exposed skin. Four years had passed since my last visit to Acarigua, four years of reflection and introspection on the nature of social action through music, four years of an ongoing effort to align ideals and objectives with practice. And as much as I had changed in the last four years, the musicians had changed more. My particular task was the Ravel orchestration of Mussorgsky’s Pictures at an Exhibition. 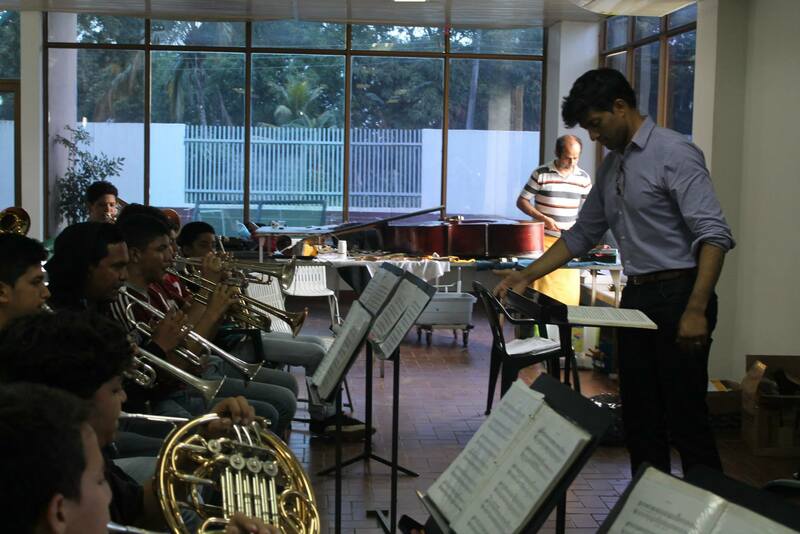 It’s a tricky work, challenging for both conductor and orchestra, and I was deeply concerned about the selection. I recalled from 2010 a small orchestra that had bravely – if barely – fought its way through 20 minutes of Tchaikovsky’s 1812 Overture and now was expected to deliver a two-hour program culminating technically with Pictures. Ten minutes after my arriving on site – after seven hours that morning in a motor coach from Caracas – I was led to the podium and asked to conduct the reading. I could tell from the drop of the baton that this was not the same orchestra. The faces were familiar, but little else was recognizable. There was a technical and musical assurance, a mental flexibility, a level of intellectual discipline that, just nascent in 2010, was now evident in every measure they played. The orchestra was larger, but the increase in numbers had not been achieved at the expense of standards, as is so often the case. The neighbouring núcleos of Agua Blanca and Turén, barely embryonic in 2010, now sent contingents of musicians capable of holding their own next to their Acarigueño colleagues. The Mussorgsky, unthinkable in 2010, would still not be a walk in the park (gallery?) for the orchestra but it was firmly, incredibly, within reach. The level of progress in four short years was astonishing. Much of the credit must go to Roberto, über-Director extraordinaire for his work. His achievements go far beyond building the orchestra: the capacities of the ensemble reflect the pedagogical culture he has built, and his strategic, successful expansion of musical activities into the smaller regional centres. This rural orchestra would put to shame many, if not all of the urban youth (if not university) orchestras in my new home state of North Carolina, orchestras that rehearse in climatic and acoustic isolation, orchestras whose members enjoy regular private instruction. 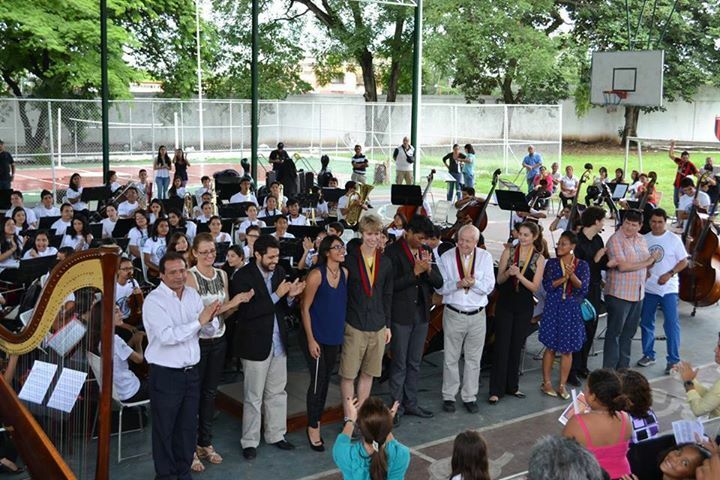 Yet bereft of what those stateside would consider basic necessities, the orchestra in Acarigua continues to grow, if not excel. And so the process of reflection begins anew, with old opinions to be revised, and new questions to answer, new mysteries to unravel. According to a wag on the 18th floor of Parque Central, I might be the only person not from the bucolic, unassuming town who has ever said “I can’t wait to get back to Acarigua!” – but then again, I might be the only non-Acarigueño who knows what extraordinary things happen there. Jonathan – Another wonderful blog from your virtual pen again. I love the way you so passionately describe this complex, difficult and amazing place and the children of the nucleo. It fills me with hope from afar. When you get back and have some space in your life, please give me a call – I have so much to tell you…. Luchar was the theme of the week, but tocar won in the end. Kind of like the last trimester of a pregnancy; the baby makes all the pain worthwhile. Oh yeah, did you forget to mention that part of the story? All the best and thank you Jonathan and family. Maravilloso el VII Seminario Internacional Portuguesa 2.014, mil gracias por todo el trabajo y dedicación . . . El lema existe en la acción , Tocar y Luchar. . .